Living in or near the Tucson Mountains is an enormous privilege. These mountains have extraordinary beauty that intensifies upon close examination. The rugged landscape is one aspect of that beauty. Another is life. We call it a desert, but it is far from desolate. Strange and wonderful plants, like the saguaro and ocotillo, are its signature, but it is filled in with 608 other plant species,(1) making it an area of great biological diversity. The plants provide the visual impact with their texture and floral displays, but they also act as the homes and food of the abundant animal life that constantly charms and delights us. Fortunately, due to the foresight of the citizens of Tucson and Pima County, large areas of the Tucson Mountains are protected permanently from development — the Saguaro National Park West, the Tucson Mountain Park, and that most recent addition, the Sweetwater Preserve, a major TMA success story. However, large areas remain unprotected while we live intermingled with the desert life that delights us, but did not invite us. Will we protect it and preserve it, or crowd it out? The protected areas will not maintain their living diversity if we cut them off from the surrounding Sonoran Desert or if we degrade the areas where we live. The science of ecology has shown that isolated areas lose species. (2) Wildlife must be able to travel between habitats. Some places are good for the summer, some for the winter, some for drought, some for wetter times. Some places are good for hiding and breeding, and others for feeding. Many species do not just stay in the Tucson Mountains, but they depend on the surrounding area, too. Being able to move is important not just for animals, but for plants as well: their seeds disperse from one place to another, transported by animals, wind and water. When one place becomes unsuitable, they must move to grow elsewhere. As climate changes, all must move. To allow movement, and to protect all the special habitats, and all the species found in only a few places, we must look after this place where we live. In doing so, we benefit the living creatures, but also the environment, and all that we value here: the experience of wildlife, the beautiful scenery, and a certain harmony that it all brings. What can we do? Well, we begin with respect and love for the local environment, and then we take action in accord with that respect and love. We restore graded land, and we work to keep all areas healthy and safe for the local flora and fauna, whether developed or not. Living here, we can be stewards of our environment. But how? We can begin with our gardens, and other plantings. There we can support the life in the region by making our gardens an extension of that life. 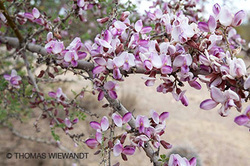 In your garden, plant species native to the Tucson Mountains. Many of our local species are actually easy to grow from seed or from cuttings you can collect on your own property. Also, many Tucson Mountains plants can also be obtained from local nurseries. For example, Desert Survivors has a nursery specializing in Arizona native plants, with many Tucson Mountain species. To find out if a plant is a Tucson Mountains native, you can consult a copy of the Tucson Mountain flora publication listed below. It will specify non-native species that should be avoided, and it will tell you the habitats where all species are found so you can choose the most suitable placement in your garden. By growing local species, you provide habitat for local animals, and you avoid introducing invasive species that might spread into the surroundings. Instead, you enhance the local populations of the plants you grow. Moreover, you retain the character of the Tucson Mountains in your garden, and become more a part of it. Your place won’t look out of place with those plants that clash with the surroundings. Plus, you’ll save water. There is much more to be said and done about living in the Tucson Mountains. Various features will appear from time to time to make suggestions, and to solicit your advice on how we can best live in this extraordinary place. 1. Annotated Flora and Vegetation of the Tucson Mountains, Pima County, Arizona, by R. Rondeau et al, Vol 12, No. 2 of the magazine “Desert Plants,” available from Desert Plants, 2120 E. Allen Road, Tucson, AZ, 85719, phone 393-8759.